The above-mentioned series require a power supply voltage of DC12 Volt. The voltage required is not so great, but to be considered, in order to have output with clear sound output and quality needed a clean power supply voltage is regulated properly. 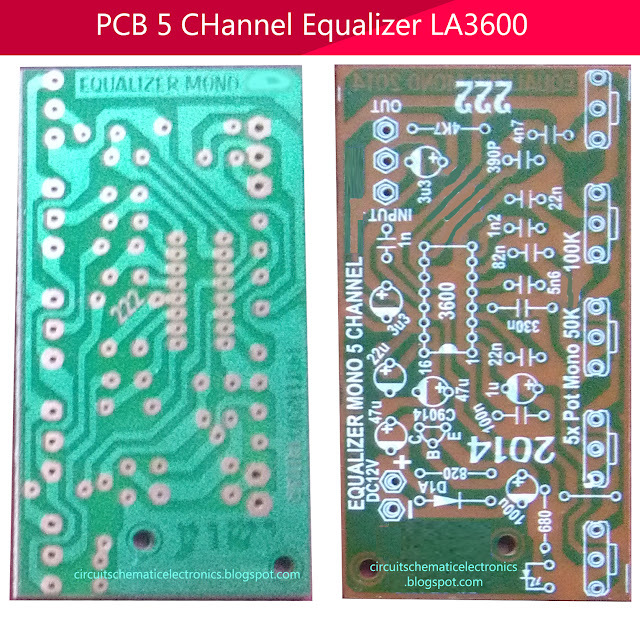 Use the power supply circuit 7812 to stabilize input voltage equalizer circuit. For the tone settings contained in 5 pieces potentiometer, arranged neatly on the PCB layout below. The frequency of the tone equalizer settings ranging from 108Hz to 108kHz. The circuit I've tested, and running normally. If you want to make I have prepared PCB layout design to facilitate you assemble the circuit's 5 Channel Equalizer.